We are sure that you really want a tool for working out without need to go far to the gym center and all you need is just to stay at home. These Sole’s product may be just what you want, and there are 2 products of Sole often being compared, that are Sole e35 and Sole E95. They are both providing an intense cardio workout and stregnth training all at once and both of them also are on top quality machines that come highly rated. Yap, it will be a hard decision to choose since the products offer similar quality inside. But, let us make you a review about Sole E35 and also the competitor Sole E95. We hope you can the difference or similarities on both product, so that for soon, you can choose the right option and can do working out at your own home easily. All Sole E35 and Sole E95 have these features sich as 20 resistance levels, 15 inch adjustable foot pedals and power decline, magnetic resistance for quiet and smooth operation, heart rate chest strap, 4 rear wheels and heavy-duty rails, and sound system with speakers. But there must be several differences in features and for example we can see from the LCd. The E35 has a slightly smaller LCD display than the E95, and the flywheel weighs 29 pounds as opposed to 40. While for the weight, The E95 is rated for a total weight of 400 pounds, whereas the E35 is rated for just 25 pounds less. And the most important thing they have different price of course. The E95 costs among $400 more than the E35, based on online pricing. The Sole E95 fitness elliptical trainer and Sole E35 is the second top quality engine that comes highly popular, offering a wide variety of exercise programs, resistance levels and leaning for variety and challenges. The E95 Sole fitness is considered to be slightly more powerful than a single E35 elliptical trainer and thus considered more suitable for heavy / more intensive use. 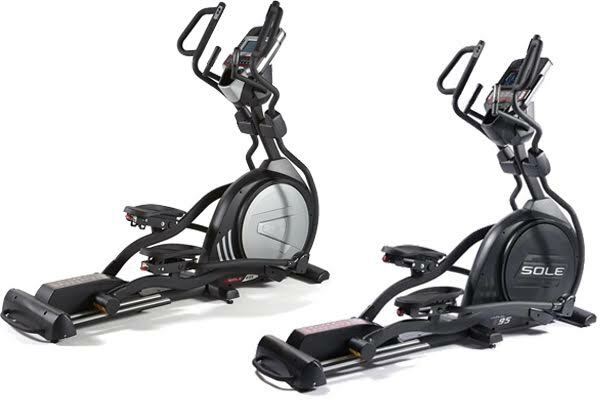 Sole E35 is considered to be mid-range between home and commercial elliptical trainers, while the Sole E95 is considered closer to the commercial elliptical trainer and as expected to carry a slightly higher price tag. The Sole E35 on the other hand is not too shabby either. Garnering multiple best buy awards from multiple experts, the Sole E35 quickly became the choice of many buyers out there. However, if you are loooking for the cheaper one, purchase Sole E35 will not hurt you by no means a mistake. Even we know between Sole E35 and Sole E95 is just different only on few things as long as they do not bother your activity on your treadmill.